A female student from the School of the Future was hospitalized after someone threw a brick through a window of a school bus this afternoon in West Philadelphia. It happened around 4:30 pm at N. 47th and Aspen Streets. 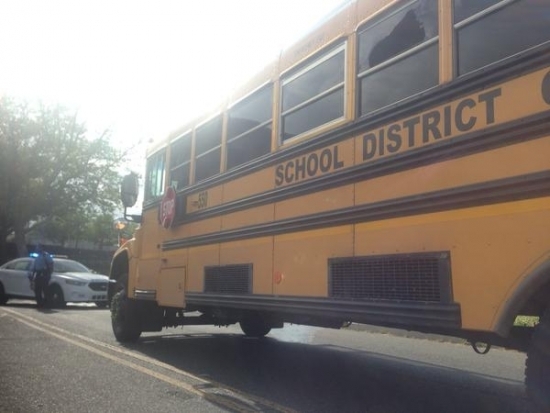 The brick was thrown through a window in the middle of the bus on the driver's side. The student was taken to Penn Presbyterian Hospital, no word on her condition. There were nine students and two adults on the bus at the time of the incident. Police are searching for several suspects who fled the scene at the time. The body of a stowaway was discovered aboard an arriving ship at a South Philadelphia port this afternoon. The ship was docked at Pier 84 on the 2400 block of S Columbus Boulevard. Around 12:30 pm, as workers began to unload the shipment of cocoa beans from West Africa, they smelled an awful odor. They found clothes, snacks, and a bag. They then saw the body of a dead man, naked and hunched over, and called authorities. The identity of the man and cause of death are not yet known. He could have died from heat, exposure to preservatives, lack of oxygen, or any number of other reasons. An autopsy is pending. It is likely he stowed away when the SIAN C ship, sailing under the British flag, left the Ivory Coast for Philadelphia. Partly Cloudy, temperatures in the mid/uppers 70s this evening in Center City.